Ms Oinkee loves: Sleep and Firm - Simply Love it! To sleep and firm the face, it has always been on my wish list. 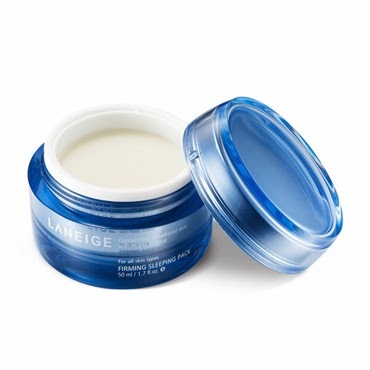 When Laneige came out with this Firming Sleeping Pack, it was like a dream come true. Finally! I started using it a month ago. It had a QQ jelly-like texture, unlike its ever popular Sleeping Pack, which was like cream. You would need the given spatula to scoop out the Firming Pack, put it on your palms then apply it on your face and not forgetting the neck. Neck is often being neglected and signs of aging will show obviously if not well taken of. The Firming Pack contains Sleepscent™ developed by Amore Pacific’s independent technology for the deep relaxation of skin fatigue. The scent is quite different from the Water Sleeping Pack_EX. Perhaps that explained why I always had a good night's sleep whenever I applied the Firming Pack. I got this from Korea at SGD$35. Singapore is selling around $40+. Do check it out! For a product with lots of goodness at a fraction of the price is truly a worthy buy. 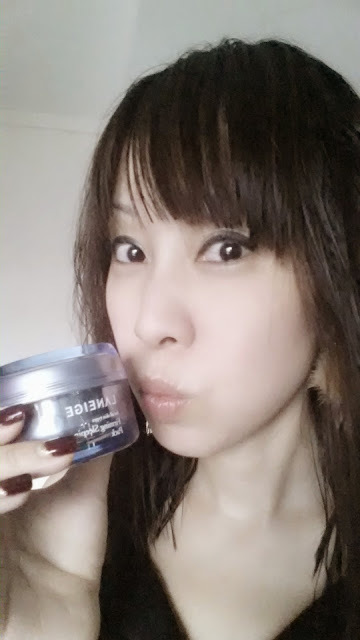 My favourite beauty Muse now:-) Early morning look after using the Firming Pack last night. Only applied Sunblock with Laneige BB Cushion on the face. You look really nice! I will try this soonest!